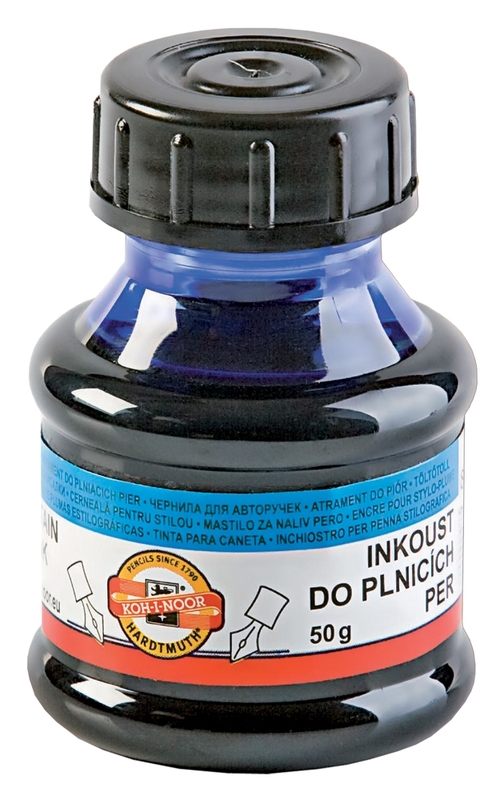 The fountain pen ink is produced by Koh-I-Noor in the Czech Republic. It comes in a plastic bottle 50 g, and it has no additional box to store the inkwell. All this I imagine is to reduce cost and offer the best possible price to the consumer. It comes in just 3 colors, blue, black and red. It is a rather limited selection, but this kind of inks are marketed towards students who need a no fuss, inexpensive ink. And when it comes to price, it is a fantastic one. 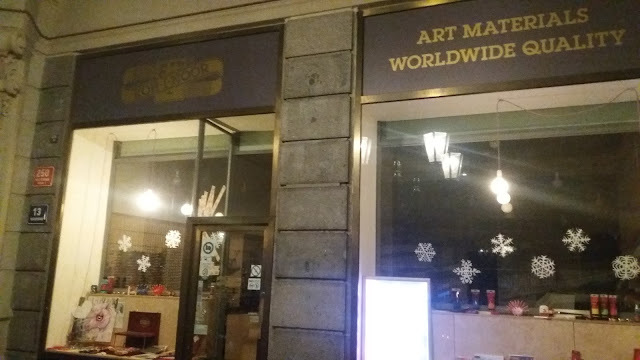 It is available in about every shop and costs between 1.1 - 1.4 Euro (average of 1.5 USD). Another comparison could be done with Pelikan 4001 blue 1000 ml (which is cheaper than black). The price on Amazon.de for 1000 ml is 26.59 euro, which translates into 0.03 euro/ml or 1.5 euro for 50 ml. This makes the Koh-I-Noor ink to be more cost-effective even compared to Hero ink or with purchase of 1 liter of Pelikan 4001 blue. Yes, the Hero comes in a glass bottle and has a box, which the Koh I Noor doesn't offer. But you have to admit the price for it is incredible. 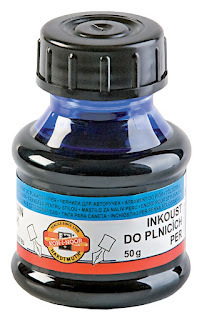 The company also produces a document ink. "Ink suitable for fountain pens, light and moisture-resistant, cannot be removed from paper without damaging the paper. For use in archives, for writing documents and at registry offices." They offer it in 50 g plastic bottle and 30 ml in a glass bottle. It is available in blue and black. Unfortunately, I could not come across this one. It is rarer than a unicorn's horn, at least in my area. So the ink comes in an unimpressive plastic bottle, the label is in Czech and English and this is about it. The top colored band from the label represents the color inside. It is a light blue, not too saturated. But I like the look of it. In appearance, it is in between the Faber Castell Royal Blue and the Pelikan 4001 Royal Blue. The Pelikan 4001 has a little more of an indigo color in it. As I stated before, the ink is marketed for students, so this is a no fuss ink. It does not have a shine or shading. But it flows well, hasn't been able to clog a pen so far, it dries reasonably fast, and does not bleed. There is an area where it doesn't do very well, and that is water. Running water over a piece of paper almost erased the entire Koh-I-Noor ink. It was hardly visible after. The Pelikan is not a lot better but I would grade it a little higher. To conclude, I give it a thumbs up. It is a great value ink.